The integration of sensory signals in the spinal cord and the brain, and in particular the cellular changes associated with the development of chronic pain and other pathological conditions of the central nervous system. Mathematical modeling of the functions of neurons. The development of new imaging techniques to study the neuronal function. Changes in synaptic physiology during aging. 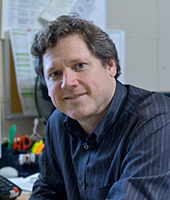 His team uses a wide array of approaches, including electrophysiological recording in vivo (micro-optrodes) and in vitro (patch clamp in slices), multiphoton and other non-linear imaging techniques, time-resolved fluorescence microscopy, in vivo optogenetics, tissue-based biochemical analysis, neural tracing and immunocytochemistry, and computational approaches. Perez-Sanchez, Jimena, Louis-Etienne Lorenzo, Irene Lecker, Agnieszka A. Zurek, Charalampos Labrakakis, Erica M. Bridgwater, Beverley A. Orser, Yves De Koninck, and Robert P. Bonin. "α5GABAA Receptors Mediate Tonic Inhibition in the Spinal Cord Dorsal Horn and Contribute to the Resolution Of Hyperalgesia." J Neurosci Res 95, no. 6 (2017): 1307-1318. Zussy, Charleine, Fabien Loustalot, Felix Junyent, Fabrizio Gardoni, Cyril Bories, Jorge Valero, Michel G. Desarménien, Florence Bernex, Daniel Henaff, Neus Bayo-Puxan et al. "Coxsackievirus Adenovirus Receptor Loss Impairs Adult Neurogenesis, Synapse Content, and Hippocampus Plasticity." J Neurosci 36, no. 37 (2016): 9558-71. Miraucourt, Loïs S., Jennifer Tsui, Delphine Gobert, Jean-François Desjardins, Anne Schohl, Mari Sild, Perry Spratt, Annie Castonguay, Yves De Koninck, Nicholas Marsh-Armstrong et al. "Endocannabinoid signaling enhances visual responses through modulation of intracellular chloride levels in retinal ganglion cells." Elife 5 (2016). Gagnon-Turcotte, Gabriel, Yoan LeChasseur, Cyril Bories, Younès Messaddeq, Yves De Koninck, and Benoit Gosselin. "A Wireless Headstage for Combined Optogenetics and Multichannel Electrophysiological Recording." IEEE Trans Biomed Circuits Syst (2016). Binan, Loïc, Javier Mazzaferri, Karine Choquet, Louis-Etienne Lorenzo, Yu Chang Wang, El Bachir Affar, Yves De Koninck, Jiannis Ragoussis, Claudia L. Kleinman, and Santiago Costantino. "Live single-cell laser tag." Nat Commun 7 (2016): 11636. Gross, Garrett G., Christoph Straub, Jimena Perez-Sanchez, William P. Dempsey, Jason A. Junge, Richard W. Roberts, Le A. Trinh, Scott E. Fraser, Yves De Koninck, Paul De Koninck et al. "An E3-ligase-based method for ablating inhibitory synapses." Nat Methods 13, no. 8 (2016): 673-8. Bonin, Robert P., Feng Wang, Mireille Desrochers-Couture, Alicja Ga Secka, Marie-Eve Boulanger, Daniel C. Côté, and Yves De Koninck. "Epidural optogenetics for controlled analgesia." Mol Pain 12 (2016). Yao, Yao, Stefania Echeverry, Xiang Qun Shi, Mu Yang, Qiu Zi Yang, Guan Yun France Wang, Julien Chambon, Yi Chen Wu, Kai Yuan Fu, Yves De Koninck et al. "Dynamics of spinal microglia repopulation following an acute depletion." Sci Rep 6 (2016): 22839. Magdesian, Margaret H., Monserratt G Lopez-Ayon, Megumi Mori, Dominic Boudreau, Alexis Goulet-Hanssens, Ricardo Sanz, Yoichi Miyahara, Christopher J. Barrett, Alyson E. Fournier, Yves De Koninck et al. "Rapid Mechanically Controlled Rewiring of Neuronal Circuits." J Neurosci 36, no. 3 (2016): 979-87. Khoutorsky, Arkady, Robert P. Bonin, Robert E. Sorge, Christos G. Gkogkas, Sophie Anne Pawlowski, Seyed Mehdi Jafarnejad, Mark H. Pitcher, Tommy Alain, Jimena Perez-Sanchez, Eric W. Salter et al. "Translational control of nociception via 4E-binding protein 1." Elife 4 (2015).